What a fun blog – and thanks for all the recipes! 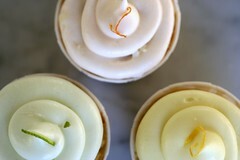 If you haven’t yet, stop by Verite Coffee/Cupcake Royale in Seattle if you are in town – it is even better than Magnolia. Oh my lord… those look so yummy. And as someone who isn’t a huge chocolate fan, I can really appreciate these. Thanks so much for sharing the recipe. Those look incredible. Newer-bie question that might make you laugh: why take the tops off for filling instead of using a pastry bag to poke a hole in the top and insert filling that way? hey, julie. completely valid question. i find that the pastry bag method works great for a more airy cupcake. this particular recipe is fairly dense and i am thinking that it would be difficult to displace much cake with the curd by forcing it in. I wanted to be sure to have a good amount of curd in there hense why I cut the tops of. srcastic – i want to try Cupcake Royale and any other cupcake spots in Seattle if i ever get back up there. chubby hubby – thanks! appreciate the compliment. will you be making boston terrier cupcakes anytime soon? You are a stinkin’ genius! How lovely they look. Thanks for sharing the recipe with us. So, I had the great pleasure to eat and enjoy these cupcakes. As great as they look, they tasted better. I had the lemon and the Lime. The grapefruit were gone from my desk by the time I got back from a meeting. wow, the cupcakes look good as usual. just a question, did you add some sort of coloring to the frosting? the last picture seem to show slightly greenish, pinkish and yellowish tinges. if so, what do you use for the coloring? hey, galinusa… i did tint the frosting slightly so it would be color coded for each flavor. I use this brand of gel food coloring, Americolor. I love you r cupcakes. The eye candy isn’t bad either! If I may ask, are you using a 2 oz souffle cup for these? actually, chronicler, they are 3.25 ounce souffle (or paper portion) cups (as they are also so glamorously known as). 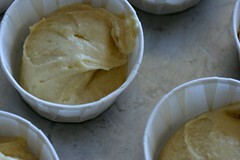 i scoop about the same amount of batter into these as regular cupcake papers, maybe slightly more. i use 1 ounce for mini-cupcakes. These look incredible. I wanted to let you know that I made your horchata cupcakes recipe with some modifictions and they came out super tasty. Rice Dream horchata worked well as a subsistute for homemade. Thanks for the fabulous recipes. How did you get the frosting so smooth? and shaped so well? Also, is there an advantage to using souffle cups over regular cupcake papers? Hey, AquaNetRocker… That’s a good question (about the smoothness). Over the years of having truly messed things up continuously (and still doing so on frequent occasion), I have found it important to bring everything to room temperature (the butter, cream cheese) before getting started. I also can’t stress enough the importance of sifting the powdered sugar, as much of a pain as it can be. That’s about all I can think of. I use no special ingredients, techniques, or equipment (I am baking out of my home kitchen) so I doubt that any of that could be the cause. As far as the soufflé cups go… in reality they are somewhat worse than regular cupcake papers in that they are hard for the eater to tear, but I find them aesthetically pleasing and able to hold shape better. This allows me to make a somewhat looser or more moist cake without it falling on itself. i love your blog and always look forward to new recipes and pics. Oh yum yum….we don’t have such adventurous flavours in cup cakes in England. Have you thought about publishing a book?? your recipies and photo’s are more than good enough….my favourites are hummingbird ones with lashings of cream cheese frosting…i make them for everyone they are very popular and a new taste experience for us Island Monkeys. mmm… these look incredible, I cant wait to try them! Incredible! May I ask if you own a bakery or anything of the sort? I have been passionate about baking since a young age and am trying to figure out how to get involved in SF/Bay area baking and pastry industry, and would love any insight you may have! hey, visivo. I actually don’t own a bakeshop. I have toyed with the idea in the past, but have a demanding and satisfying full time job. I also found when I did bake for money that it took a lot of the joy out of it :( Maybe I will change my mind some day. 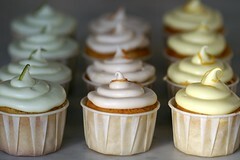 I should mention that I “got started” with a website, cupcakebakery.com which I started up like 4 years ago. I got a handful of orders through the site (people searching and stumbling upon it)… enough to get some experience and know that it stressed me out! So, maybe try that and see if it works for you. Good luck with your pursuits! Thanks for the response. :) I definitely see potential high-stress levels in trying to start a bakeshop of my own. Looking into CCA for the baking program, too. Hopefully it’s worth the money. I love your blog — your recipes are innovative and inspiring, not to mention beautiful! I got them here. I finally remembered where I got just a sleeve… most places only sell them by the case of 5000! I got the Pleated Portion Paper Cup, 3.25 oz which are the only ones sold by the sleeve. Hi, how fun to find another SF blogger! Your cupcakes are so adorable and perfectly finished! I have a question for you: I was thinking of using those bundt-style pans that make individual cakes in the shape of flowers, hearts, etc. and filling them like cupcakes. But since the tops are shaped I can’t cut them off to fill them that way. I thought of poking a bag through the bottom to fill them but there would a hole – maybe I could cover that up somehow. Any suggestions? thanks so much! Hi chockylit! 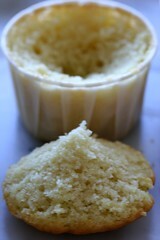 I just found your site while looking for a recipe for coconut cupcakes because I wanted to fill them with lemon curd! I love it! Your recipes are so adventurous and inspiring. I also tried to copy the way your frosting looks – but mine didn’t come out nearly as pretty. Thanks for the help! Hi Chockylit. I just made these cupcakes yesterday and there’s only one left now =). What’s the reason for using All-purpose flour only rather than the All-purpose/Self-rising combo from the Magnolia recipe? hey, m-ee, yeah i find defrosting the microwave, even briefly, can do some irreversible damage. (i have done the same thing myself.) I definitely don’t recommend it. that being said, if the frosting is runny, keep adding confectioner’s sugar until its thick again. it may get a bit sweet, but… its a balance act. as far as the flours go, i simply don’t want to have to buy self-rising and all-purpose. i don’t have enough space for containers for it all. so, i use all-purpose and add the baking soda/baking powder. When are you going to post more cupcakes? I’m dying!! Wow, those look amazzzzing. How difficult was it to eat them out of the souffles? Shoot, I have to look at what food colors I use. Basic ones from Americolor, but in this recipe, I used very little. Jordyn, The souffle cups are a tiny bit of a pain (my friends and family have become quite good at ripping them apart however), but they look great and make it easier to bake a bunch (can fit like 24 on a sheet pan) and transport. I just tried this cupcake (mini-size) with lemons from my yard. It was so amazing! Like little bursts of spring flavor in your mouth. Thank you! I will be making them for my brother’s wedding reception. Also, I think I’ll be trying your devil’s food with chocolate buttercream frosting for my mother-in-law’s birthday soon. I’ve a quick question about it. She’s turning 65. I’m thinking of home-making little “65”s with white chocolate (piping it out onto wax paper and cooling it before putting them on the cupcakes). Have you ever tried anything like this — and would you suggest any flavor other than white chocolate that would be visible on the cupcakes so as not to go too far outside the richness of dark chocolate? long time lurker here :) hello! i love your cupcake blog but sometimes i avoid it on purpose because it gets me craving and i start to make cupcakes and i end up with more than a dozen and there’s only two of us in the house and, well, before i know it, i’ve gained another 4 pounds :P lol! here’s to the next 4 pounds! :D lol! Hi Chockylit, I made my first batch of lemon curd cupcakes since I discovered your site last week. The cupcakes are amazing!! I did change the curd recipe to one that I normally use with only lemon juice and eggs (the frosting is already a lot of diary and butter for me). Thank you so much!! i’m in the process of baking these right now :) just noticed that you didn’t mention salt in the actual steps, but i assumed it’s supposed to be sifted with the flour and baking soda and powder. thanks for the fantastic recipes! This was a fun recipe! I just posted my results! Can’t wait to use the leftover curd too! These are like wedding cake–dense and bland. I had very positive responses and a few negative ones. I guess you either love it or hate it. The curd is tricky! I’ve made Martha’s lemon curd before, but back then I used her recipe from the “Martha Stewart Living Cookbook” (colletion of 1,200 recipes)and had much better luck with consistency. This was runnier for some reason, but I used it anyway. I think it might be more difficult when using such a small amount of whipping cream (?) But I am not a pro, so I don’t know all the tricks. I know I over-beat it, but again–it was hard to gauge such a small amount. I’d let people know this, or possibly reccomend making a bigger batch and storing some of it. Is there any way to get the cake sweeter? Thanks for all the beautiful photos and inspiration! Hi Chockylit. I have 2 questions regarding your recipes. Sometimes you use backing soda and backing powder – what is the difference? I find it easier to find/buy backing powder rather than soda. Second: What do you mean with vanilla? Do you mean liquid vanilla aroma, the dried pot (beans) or sugar vanilla (e.g. http://www.oetker.ca/cgi-bin/WebObjects/oetker.woa/wa/page?focus=US&option=prd_920&destination=page_36)? I just graduated from college and realized that I no longer wanted to persue what I had gone to college for. I thought about starting a baking company but found that trying to get someing perfect/ sell-able every time was more stressful than fun so I decided against that as well. But, I LOVE baking and your website has inspired me to do more cupcakes (I had been sticking to cakes and cookies and some pastries). So, I tried these but the curd did not work out for me. I went over the recipe several times and I believe I did everything right (except I only let the whipped cream come to a soft peak stage). I don’t think my problem was the cream, I think it was the fruit part. It was very liquidy. I didn’t end up putting it in the cupcakes because it would’ve just soaked into the cake. I even let it chill overnight but it just continued to be far too liquidy. Any suggestions on what I did wrong? Please let me know, the flavors were great and I’d love to use the lime one especially. Thanks for all the inspiration!! These are beautiful. Just a quick question- how and for how long should I store these cupcakes if I make them? I found this incredible website. You are amazing and so creative, adding spices to the cupcakes. I love this, please allow me to put a link back to my website and blog. I just made a batch of these yesterday. They are outrageously good and are nearly gone. Thanks for sharing the recipe!!! I’m a student taking culinary, thanks for sharing your recipe. I am going to try it! What was the exact quantities you used to make the 3 seperate curds?